What a special treat a Mimosa is! This Mimosa Recipe is the drink to serve and enjoy when having a Mother's Day with brunch or perhaps when you take a special vacation and you wake up to gentle music and have an entire day just to relax. Nothing says "special day - special person" like a Mimosa. Okay…I’ll be honest. This is the second most popular Sunday beverage at breakfast/lunch regularly. Only the Bloody Mary is more popular. The basic Mimosa recipe is on this page, but also included are several variations that you really should consider trying. Once you do, you may no longer be happy with the standard version, although it is very good, too. 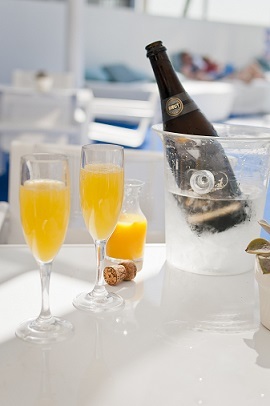 A Mimosa is a cocktail recipe having two parts of thoroughly chilled orange juice combined with three parts champagne. It's just that simple and easy ...and delicious! Often the drink is served in a tall champagne flute, but I think you will want to use a large wine glass if you like ice in the drink (like I do) or if you are making a Passion Fruit Mimosa or the really delicious Mama Mimosa (my husband calls it "Big Mama Mimosa" ...don't ask me why). 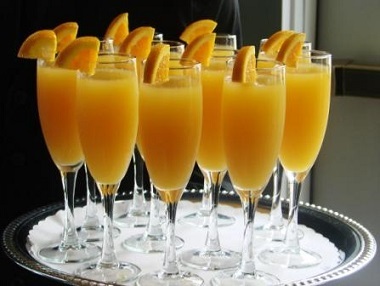 The basic Mimosa recipe was first created at a hotel in France about 1925. I do not know who invented it or even what the occasion was. It may have been the bartender was just experimenting. If you want more ice, use a large wine glass and pour 3 parts of champagne in the glass and then add 2 parts orange juice. Now here are two more Mimosa recipes I really like. Give these restaurant drink recipes a try, you'll agree. Mimosas are often associated with special occasions or brunch events but why not bring your special occasion to a new level with a few new Mimosa recipes? From the traditional OJ and champagne to the Mama Mimosa, these recipes will add an extra flare to every occasion. Preparation time: 1 1/2 minutes. Serves 1. This Mimosa is not called the "Mama Mimosa" for nothing! I really love this Mimosa! Add 2 tablespoons of orange liqueur and very gently stir. Garnish with a sliced orange and Enjoy! Have a party! Enjoy your Basic Mimosa and the variations of the recipe on this page and the company of those you share them with!